We were recently asked to become Friends of Sylvanian Families which was super exciting to me as I used to play with them as a child and Summer is just getting to the age where she would love to play with them. First created in 1985, Sylvanian Families is a unique and adorable range of distinctive animal characters that live, work and play in the idyllic land of Sylvania. Sylvanian Families originated in Japan and made the journey to the UK in 1987. It became an iconic toy of the ‘80s and received the UK Toy of the Year award for three years running. Sold in over 50 countries, Sylvanian Families is a global brand, with themed restaurants and a dedicated theme park in Japan. To date, more than 100 million Sylvanian Families figures have been sold worldwide. Sylvanian Families are more than just toys; these anthropomorphic creatures have their own names, birthdays and even personalities. They live in stylish houses, surrounded by luscious greenery, woodland, a meadow and a river – making up the natural world of Sylvania. Sylvanian Families is turning 30 years young this year, so make sure to celebrate its birthday and keep an eye open for Sylvanian events by checking out the website here. 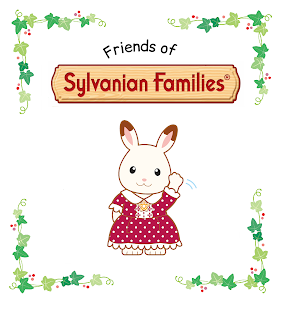 So what does it mean to be a Friend of Sylvanian Families? Well it means that we got sent this adorable goodie bag full of Sylvanian Families treats like magazines, stickers, playing cards and colouring sheets plus a super cute little outfit for one of the figures. It also means that we'll be the first to hear about exciting product launches and some Sylvanian Families items to review. So if you love Sylvanian Families then keep your eyes peeled for more about them coming soon.